Cons • Longer range likely on downlink only. Ubiquiti sent a few access points to help us review its UniFi 3.0 Enterprise Wi-Fi platform. We found the 5 GHz performance of its latest AC1750 class Ubiquiti UAP-AC Acess Point disappointing and are working through some problems found during the retest. In the meantime, we also tested the N300 class UAP-LR (Long Range), so let's see how it stacks up. 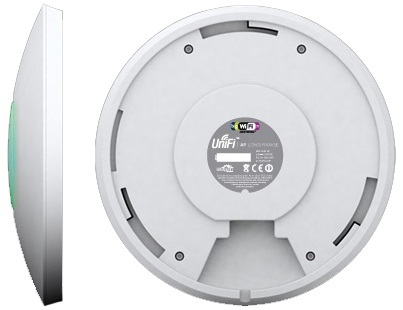 The UAP-LR is an business-grade 2.4 GHz N300 class access point managed via the free UniFi 3.0 software controller that runs on Windows, MacOS or Linux. Included in its package are a mounting bracket, ceiling backing plate, various screws and nuts, power cord, 24V passive PoE injector and Controller CD with user guide. The table above shows the LR is one step below Ubiquiti's only dual-band N AP, the UAP-PRO. That step is pretty steep in price going from around $90 street for the LR to $220 for the PRO. Note that the "Ubiquiti" 24V PoE injector that comes with the LR is not 802.3af/at compliant. This means that if you want to install more than a couple of Ubiquiti APs, things could get messy as the graphic below illustrates. But you can solve that with a Toughswitch PoE PRO that'll provide eight powered Gigabit ports for around $200. The UAP-LR is meant to be installed on a wall or ceiling and includes brackets for mounting. As an enterprise-level access point, the exterior is all business. The human-facing side of the access point has an LED that shows the various states of the access point. The back side has one 10/100 Ethernet port. The 10/100 port was surely used to keep product price point down and it is adequate for the N300 speeds the device is capable of. A reset button is also included that allows for returning to factory defaults. The board design of the UAP-LR looks very clean and compact with no heatsink on the Atheros AR7241 CPU. The table below shows that the N300 UAP-LR is a completely different beast than the AC1750 UAP-AC, which is included for comparison.